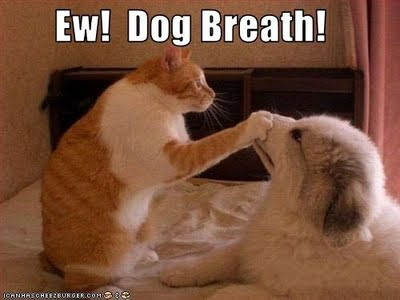 Some dogs and cats alike really have bad breath. So instead of giving them a kiss or exercising them til they pant, we avoid these activities. We don't even allow them to lick us at times. If your pet's breath is bad, chances are the culprit is plaque. Like us, our pets also need a little brushing. Although I've been blessed with dogs who hardly have bad breath, I think it would be a good idea to tackle this problem and place in some tips for those owners who can't stand their pet's "air". 1. Brushing. Some pets require tooth-brushing like adults. And like people, the most highly recommended number of times of brushing is twice a day. Before you complain that that's quite a tedious task, read my next advice. 2. Start brushing early. When we were kids, our parents used to brush our teeth for us. Although we can't just ask our dogs to brush for themselves now that they're old, the same concept of starting them young is important. Before you go rushing to the pet shop to buy minibrushes, begin by gently handling and stroking your pet's mouth gently. Once he starts to get comfortable with it, lift one side of his lip and begin brushing in a circular motion on the exposed teeth with a piece gauze (thin cloths will do) on that finger. After a few days, you can start using that minibrush you've been dying to try on. 3. Use tasty toothpaste. Most toothpaste for pets come in a variety of flavors your pet would love, so start them with those. NEVER EVER USE HUMAN TOOTHPASTE THAT FOAMS. This is dangerous to pets as swallowing it will give them an upset stomach. This should also answer the question if they spit or not. 4. Give 'em the crunchies. 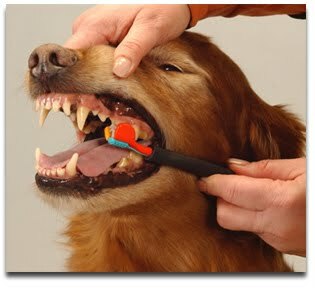 Feeding dogs with raw carrots and fruits they might take a liking to can help as mild tooth cleaners. My dog loves mango and apples so that's probably part of the reason they don't have bad breath. 5. Minimize the canned food. 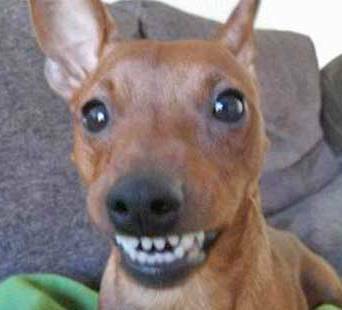 Dry meals are good for pets since most kibbles can help in scraping the surfaces of the teeth. 6. Stricken his eating time. Some pets eat really slow. So make it a rule to make sure your dogs eat up his entire meal within an hour. If there's food left, pick up the bowl. Having to chew on food the entire day promotes bacterial activity. 7. Rice, Rice, Rice. I think this is one of the reasons why my dogs don't get bad breath. I feed them rice with cooked viand because canned food are more expensive. The good thing about rice and whole grains is they move faster and more readily in the pet's digestive tract. 8. Say goodbye to scraps. This is a big no no. Feeding pets scraps isn't healthy, diet wise. And it can also promote harmful bacteria activity in the mouth once done often than the allotted meal time. 9. Paint it black. Of course, it'd be stupid to paint all biscuits and treats black. But if you were caught between the dilemma of choosing a specific color and black, choose black. Most black treats have charcoal in them. Charcoal is a binding agent that can absorb bad odors. But don't go haywire on charcoal, being a binding agent also makes it absorb other nutrients your pet may need. The following tips below are exclusive for dogs. 10. Give the dog a bone. Giving or rawhides are good at clearing up those plaque build-up. So if you ever get a chance, don't forget to give Fido a big juice bone. 11. Rope Flossing. Those rope toys sold in pet shops are not only fun to play with but they also create a flossing action that can dislodge bacteria and plaque buildups in our dog's canines. A plaque-less dog is a happy dog. This picture is just proof.